Police have issued an efit of a suspect who confronted a couple with a knife when they answered the door to him in Beauclerk Way, Hastings. The man burst into the premises brandishing a knife on Sunday, February 4, at about 8pm, Sussex Police said. 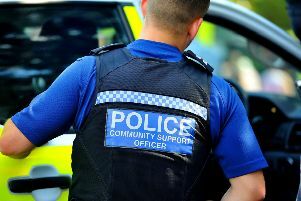 The male occupant of the premises climbed out of a window and onto the roof to evade the intruder, who then fled and is believed to have got into a dark coloured saloon car. On trying to climb back through the window the man fell onto a grassed area outside and suffered serious injuries, including a punctured lung. After initial treatment at the Conquest Hospital, St Leonards, the victim was transferred to the Royal Sussex County Hospital, Brighton, where he is in a serious but stable condition. The suspect is described as black, between 5’6” to 5’7”, of stocky build and was wearing a hooded green top. He is missing one of his front teeth, police said. Anyone who recognises the suspect or who noticed suspicious activity or vehicles in the area or who may have other information is asked to contact police online or phone 101, quoting serial 1099 of 04/02.